1. For the information and guidance of all concerned, the Department of Education (DepEd) issues the enclosed Policy and Guidelines on Healthy Food and Beverage Choices in Schools and in DepEd Offices for the promotion and development of healthy eating habits among the youth and DepEd employees by making available healthy, nutritious, and affordable menu choices, and for setting food standards. d. provide guidance in the selling and marketing of foods and beverages in schools and DepEd offices, including the purchasing of foods for school feeding. 3. DepEd Order No. 8, s. 2007 entitled Revised Implementing Guidelines on the Operation and Management of School Canteens in Public Elementary and Secondary Schools Policy Statements Nos. 4.4, 4.5, and 4.6 are modified accordingly by this issuance. 4. This Order shall take effect immediately upon publication on DepEd Website. According to the World Health Organization, malnutrition in all its forms presents a significant threat to human health. WHO confirmed the Double Burden of Malnutrition (DBM) the world is facing today, especially in developing countries. DBM is defined by WHO as the existence of undernutrition side by side with overweight and obesity in the same population across the life course. Hunger and poor nutrition contribute to early deaths of mothers, infants, and young children, and impaired physical and brain development in children. At the same time, rising cases of overweight and obesity worldwide are linked to an upward trend of chronic and non-communicable diseases, also called lifestyle-related diseases, like cancer, cardiovascular diseases, and diabetes. These conditions may be life threatening especially in areas where there are limited resources and already overburdened health systems. The 8th National Nutrition Survey (Department of Science and Technology-Food and Nutrition Research Institute, 2014) showed that for children aged five to ten years old, 29.1% were underweight (low weight for his/her age), 29.9% were stunted (low height for his/her age), 8.6% were wasted (low weight for his/her height), and 9.1% were overweight (high weight for his/her height). The double burden of under and over nutrition experienced by the school children in the Philippines is due to the fact that total food intake for some children has remained inadequate, resulting in undernutrition. Unhealthy food eating patterns – more sugars, fats, and oils, and less leafy vegetables and whole grain cereals, and a sedentary lifestyle led to an upward surge in overweight and obesity. For long-lasting benefits of prevention and health promotion efforts, it is important to affect change not only in the individual but also at the community level, and schools are recognized as good venues for health promotion strategies. In June 2016, the World Health Organization spearheaded a Regional Workshop on Regulating the Marketing and Sale of Foods and Non-Alcoholic Beverages at Schools to call upon countries to prioritize restricting the sale and marketing of food products high in sugar, salt, and fat, setting school food standards, and increasing the availability and accessibility of healthy options. It is in line with the above concerns that this policy is being issued. This Policy and Guidelines shall apply to all public elementary and secondary schools, learning centers, including DepEd Offices in the Central, Regional, and Division Levels. Private schools are likewise enjoined to adopt these guidelines. I. Trans fat – can be naturally occurring and artificial. Naturally-occurring trans fats are produced in the gut of some animals. Artificial trans fats are created in an industrial process that adds hydrogen to liquid vegetable oils to make more solid. These can be found in many foods such as donuts, baked goods including cakes, pie crusts, biscuits, etc. a. Each School shall develop their own healthy menu ensuring that the foods and drinks offered are nutritious, affordable, and compliant with these guidelines for approval by the Schools Division Superintendent (SDS]. b. Food and beverage choices available in canteens within the schools, learning centers, and DepEd offices shall adhere to the requirements of a healthy diet as defined in Section I1IA. It is important to achieve dietary energy balance coming from the intake of carbohydrates, fats, and protein to maintain a healthy weight. Attached as enclosure is the Recommended Energy Intakes per day (Philippine Dietary Reference Intakes, 2015]. c. The canteens in schools and DepEd offices shall not sell foods and beverages high in fat and/or sugar and/or sodium including, but not limited to the foods enumerated in Table 6. There shall be a shift towards healthier fat consumption by providing more of foods with unsaturated fats and limiting foods laden with saturated and trans fats. d. The daily intake for carbohydrates should be within the recommended limits while the daily intake for foods with free sugars should be less than 10% of total energy. For additional health benefits, WHO recommends a further reduction in sugar consumption to less than 5% of total energy. e. The daily intake for sodium should be at least 500 milligrams (mg) but not more than 800 mg per day (PDRI, 2015]. To reduce salt and sodium consumption, salt intake should be less than two (2] grams per day this is equivalent to 800 mg of sodium]. This is approximately equivalent to less than half a teaspoon of salt. Foods naturally high in sodium (i.e., processed foods and canned goods] as well as foods with added sodium and salt should also be limited. School/DepEd Canteen personnel shall practice gradual reduction of salt in order for the school children and personnel to adapt to the reduced saltiness of foods through time. f. Pinggang Pinoy is a plate-based food guide, a simple and familiar image associated with eating that provides immediate visual cues about portion size on a per-meal basis. The new food guide informs consumers how to build a healthy and balanced meal. Using a familiar food plate model, it shows the approximate relative proportions of each of the food groups for consumers to eat a high proportion of vegetables and fruits, eat moderate amounts of energy and protein-rich foods, and consume less fatty and sugary foods. Pinggang Pinoy also suggests drinking lots of water and less of sugary beverages. In addition to eating a healthy diet, it also encourages exercise or physical activity, an important component of a healthy lifestyle (See enclosure for Sample Meal Plans and Menus). Most food products have Nutrition Facts on their labels which provide information about the nutrition content of a food or drink as prescribed by the Department of Health Administrative Order No. 2014-0030. The nutrition facts are presented in a tabular form declaring the amounts of protein, carbohydrates (dietary fiber and sugar), fat (saturated fat, trans fat, and cholesterol), sodium, and energy or calories. h. Food products with Nutrition Facts shall be evaluated using the cut-off points for the three categories given in Tables 1,2, and 3.
i. The GREEN category includes foods and drinks that should ALWAYS be available in the canteen. These foods and drinks are the best choices for a healthy school canteen as they contain a wide range of nutrients and are generally low in saturated and trans fat, sugar, and salt. ii. The YELLOW category includes foods and drinks that should be served carefully. These foods and drinks contain some nutrients but at the same time also contain large amounts of saturated or trans fats and/or sugar and/or salt If eaten in large amounts, these foods and drinks may contribute to excess calories. These may be served once or twice a week only (Tuesdays and Thursdays), in smaller servings, and should be less prominent in the canteen menu. iii. The RED category includes foods and drinks not recommended in the canteen menu. These foods and drinks contain high amounts of saturated fat or sugar or salt and should not be served in healthy school canteens. They may also provide excess energy or calories. Consumption of these foods and drinks outside the school premises is at the discretion of their parents. i. 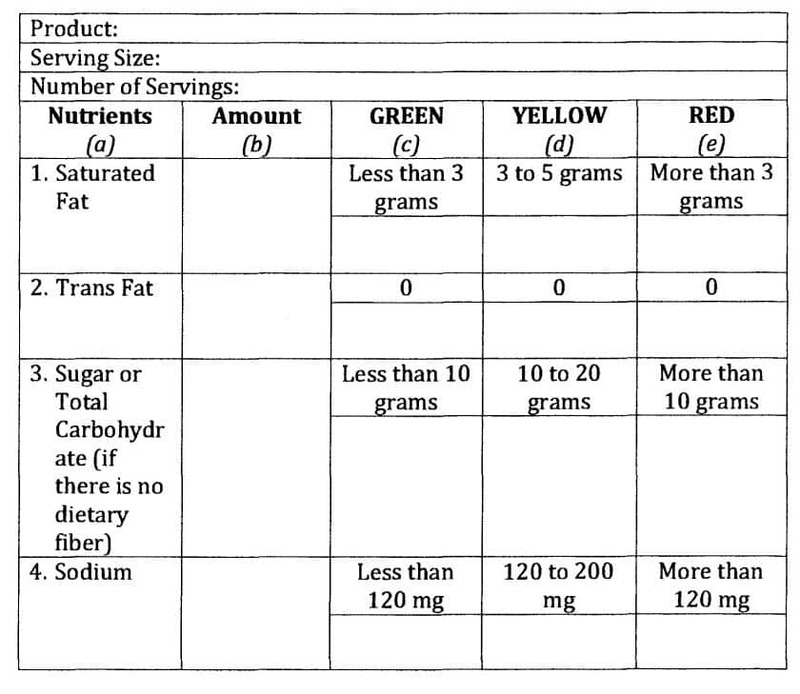 In evaluating the nutrition content, indicate in column b the amounts of saturated fat, trans fat, sugar or total carbohydrate (if there is no dietary fiber), and sodium per serving as reflected in the label of the food product. Compare the nutrient contents against the criteria in columns c, d, and e. Check under which column the particular nutrient falls. ii. Only those items with saturated fat, trans fat, sugar or total carbohydrate (if there is no dietary fiber), and sodium evaluated under the GREEN or YELLOW categories may be served in the school canteens as prescribed under Section IIIA of these guidelines. iii. If the item has one nutrient under the RED category, the food product should not be sold in school canteens. j. Categories/Description of Non-packaged foods and drinks – A new system of categorization of foods and drinks is hereby introduced for non-packaged items with no available Nutrition Facts that are sold in the canteens to guide the school heads and teachers in-charge of canteens in planning and creating their own healthy menu. Locally available natural foods are preferred over processed food products. Foods and drinks shall be categorized as GREEN, YELLOW, and RED. Canteen-cooked foods, common Filipino snack foods or those without Nutrition Facts may be enumerated under a Food List classified as GREEN, YELLOW, and RED. Sample Food Lists are in Tables 4, 5, and 6.
ii. The RED category includes foods and drinks not recommended in the canteen menu. These foods and drinks contain high amounts of saturated fat or sugar or salt and should not be served in healthy school canteens. They may also provide excess energy or calories. All types including chocolates, hard/chewy candies, chewing gums, marshmallows, lollipops, yema, etc. Deep-fried foods including fish balls, kikiams, etc. i. Compare items against GREEN, YELLOW, and RED categories. If it fits easily into the GREEN category, the item may be included in the healthy menu and be sold in the canteen. If its fits easily into the RED category, the item must not be in the healthy menu and should not be sold in the canteen. ii. If the item does not fall under GREEN or RED, it is likely to fell under the YELLOW category, it may be served once or twice a week only, in smaller servings, and should be less prominent in the canteen menu. The canteen may follow suggestions in greening the menu. remove excess fat/oil from soup and soup stocks. a. Safe drinking water should be made readily available. b. Soy sauce, fish sauce, and other locally available condiments/sauces should not be readily available on dining tables and in the dining area. These should only be served upon request. c. Schools shall advise parents and guardians to provide healthy foods and beverages to be consumed in schools (baon) by their children. School children (elementary, secondary, and senior high] shall not bring unhealthy foods and beverages to school. d. Offices and Schools may conduct local initiatives to support and promote the consumption of healthy foods such as “Meatless Monday’’ to promote sources of protein other than meat, “Vegie-Tuesday” to promote vegetable consumption, “Native Wednesday” to promote consumption of native foods, “Fibrous Thursday” to promote consumption of foods rich in dietary fibers, and “Fishy Friday” to promote consumption of fish. vi. provide a conducive, well-ventilated, well-lighted, safe, and clean environment for eating. f. Canteens and other areas where food is served shall post signages that only healthy food and drinks are served in the premises, as well as important nutrition messages such as the Nutritional Guidelines for Filipinos (NGF], Ten (10] Kumainments, Pinggang Pinoy, and others. i. Advertising – typical advertisement of sugary drinks in schools is done through branded vending machines, branded refrigerators and ice boxes, signage in school canteens, corridors and sports facilities, and on sun umbrellas and tents. iii. Promotion – promotion of sugary drinks and other empty-calorie snack foods is done through the use of popular cartoon characters, branding, free samples or other “tie-ins” and celebrity endorsements. Price discounts or vouchers may be given as educational rewards. b. DepEd may allow support of food and beverage manufacturers that meet the criteria of this policy as part of their corporate social responsibility program provided that it shall not include any form of marketing activities or bear any brand name or logo. i. Print such as posters, leaflets, brochures, comics, etc. ii. Outdoor ads such as billboards, tarpaulin, etc. ix. Conduct of special events such as sports activities and feeding programs. e. Schools are given three (3) months to replace/remove refrigerators and other equipment/facilities with logo or brand name of unhealthy foods and beverages. The DepEd concerned offices at all levels shall be responsible in capacitating the Regional and Division personnel, who shall in turn be responsible in capacitating HE and TLE teachers in all schools. Schools shall conduct activities to orient students and their parents and guardians on these healthy food and beverage choices so that healthy eating habits will not only be practiced in schools, but in their home, as well and create a lifelong healthy eating behaviour for all Filipinos. Partners and key stakeholders in advancing the School Health and Nutrition Program are recognized as vital in program implementation. However, DepEd and school authorities and personnel shall strictly observe the prohibition on accepting donations or sponsorships from or having financial or material involvement with tobacco companies. Likewise, prohibitions stipulated in Executive Order No. 51 or the Milk Code of the Philippines, particularly those on the acceptance of funding, sponsorship, logistical, training, financial or material incentives, or gifts of any sort from companies that manufacture or market infant formula and other milk substitutes shall be strictly observed. In general, sponsorships and partnerships shall not be allowed if conflict of interest is likely to arise with the objectives of this policy. The Regional Offices (ROs] and Schools Division Offices (SDOs) are encouraged to launch programs that will support healthy diets and physical activity for its employees and school children. The schools are encouraged to promote and provide opportunities for school children to be active in a safe environment. WHO recommends that children aged 5-17 should accumulate at least 60 minutes of moderate to vigorous intensity physical activity daily. Incorporation of healthy diets, wellness, and physical activity in the K to 12 Curriculum and in other school events and activities. Management of overweight and obesity cases in schools through health talks to be conducted by the school nurses and engaging these students in more physical activities. f. Monitor and provide technical assistance to DepEd offices in the implementation of this policy. e. Monitor and provide technical assistance to Schools Division Offices (SDO)/School on the implementation of this policy. f. Monitor the compliance of the schools to this policy and ensure that only healthy food and drinks are available in the schools. e. Advocate to local government units to regulate the marketing of unhealthy foods outside the school premises. 1. The DepEd Central, Regional, and Division Offices shall continue to gather feedback on the implementation of this policy and guidelines from all concerned internal and external stakeholders. A periodical review of this policy shall be conducted to be responsive to the changing health and nutrition needs of the office and school populace. 2. The regional and division monitors are expected to monitor compliance with these guidelines quarterly and monthly, respectively. Department of Health-National Nutrition Council. (2016), Department Order on Healthy Food Options (draft). Department of Science and Technology-Food and Nutrition Research Institute. (2002). Recommended Energy and Nutrient Intakes. Department of Science and Technology-Food and Nutrition Research Institute. (2015). 2013 8th National Nutrition Survey. Retrieved from http: / /www.fnri.dost.gov.ph/ Department of Science and Technology-Food and Nutrition Research Institute. (2014). Philippine Dietary Reference Intakes 2015. Department of Science and Technology-Food and Nutrition Research Institute. (2016). Pinggang Pinoy. Any personnel who violate any provision of these guidelines shall be dealt with administratively pursuant to DepEd Order No. 49, s. 2006 The Revised Rules of Procedure of the Department of Education on Administrative Cases.